yellow moong dal recipe collection. indian yellow moong dal recipes. Moong dal that has been skinned and split so that its yellow color shows is called Yellow moong dal. This moong dal can in turn be converted into a flour/powder or a paste or cooked down to a liquid. Even though almost all recipes that have moong dal are savory, there are a few amazing sweet recipes as well that have been eaten in India since generations on end. Below is a gist of the versatility of moong dal which is showed by the sheer versatility of yellow moong dal recipes. 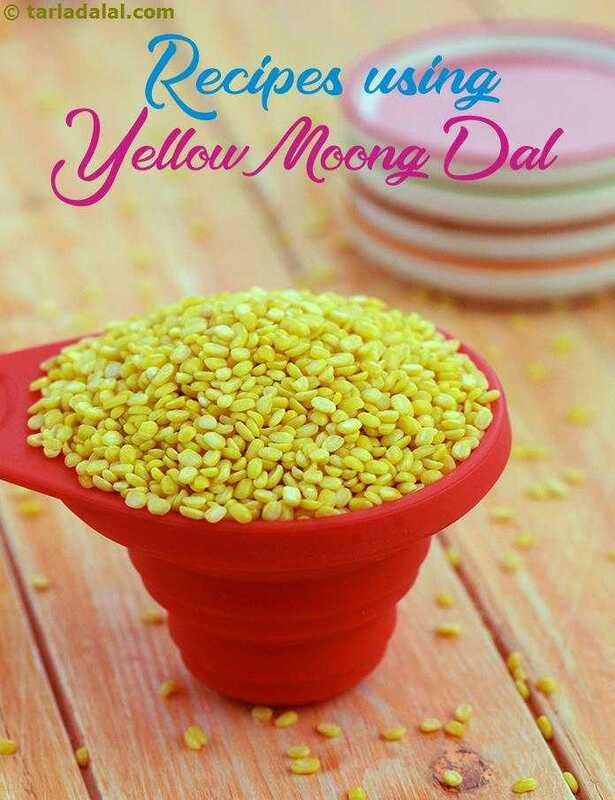 If you want to know the Health Benefits of Yellow Moong Dal click here. Parathas/rotis - Moong dal and Indian food go hand in hand. It is used as various forms in parathas, rotis, subzis and dals, breaking the common misconception that moong dal can only be used to make the dal-chawal. Yellow moong dal cooks fast while still remaining a little crunchy. That comes in handy while making Yellow moong dal and Spring Onion Parathas or even Cabbage dal paratha as it gives an excellent flavor and texture. If you want to avoid any other vegetables, you can simply make Dal Paratha, where the dal is sautéed with spices and then filled. Yellow Moong Dal Subzis – even though dals are usually not eaten as subzis, you can make certain exceptions. Methi and Moong Dal Subzi is a simple, healthy subzi that can be made in under 10 minutes with a jeera and garlic flavor running through it. Replacing methi with suva/dill and cooking the dal with tomatoes, gives a really nice texture without it being too mushy, making Moong Dal and Suva Subzi amazing to eat. Dals and Khichdis – When cooked and grinded properly, yellow moong dal gives a super creamy texture which is perfect to make Dal. Spicy Yellow Moong dal is made without any oil and still tastes just as amazing then the one with tadka. Combining moong dal with masoor dal and aromatics like ginger, garlic and rai creates a flavorful, fragrant Dal Fry. Khichdi, a traditional Gujarati rice and dal recipe, is perked up with the benefit of bajra in the Bajra and Moong dal Khichdi. It's such an unusual way to think of dal being put in soup, but I promise you it is wonderful! The Healthy Lentil soup is wonderful appetizer to go with your food and it doesn’t pound on the calories like crazy! Another zero-oil recipe is Moong Dal and Spinach Soup which has the intense saltiness of palak with the mildness of the moong dal. Replacing a meal with a One Meal Soup made with moong dal, carrots and onions is not only filling, but also nutritious. Generally dosas are made with urad dal. What people don’t know is that even moong dal is used to make crispy, healthy dosas like Poha Yellow Moong Dal Dosa. A very Famous Gujarati snack, with a slight twist, is Moong Dal Khichu, which makes it even more delicious. Here the rice flour is replaced with yellow moong dal, seasoned with green chillies and cumin seeds and served with koro sambhar. A Kachori is a crispy, deep fried snack with different types of fillings, perfect for any occasion and loved by all. One really famous variation of it is Moong Dal Kachori, where the other casing is stuffed with a spicy moong dal mixture. This filling is also added in a different type of kachori to make Khasta Kachori Chaat, where the kachori is super flaky and perfect. Moong Dal Dhokla, a fluffy snack in which moong dal is fermented with besan, topped with a tadka, is snack that is loved by Gujaratis all around the world. The fact that they are so much fun to eat and sponge like, is just an icing on the cake. May it be the rainy season or not, Moong dal Pakodas are much loved as they crispy on outside and soft on the inside. Since Moong dal has such a neutral flavor, it can easily be incorporated into sweet recipes. Moong Dal halwa is enjoyed throughout Rajasthan during the winter months and can be stored for long time. Even though it takes time to prepare, it is most definitely worth the effort. Just like that in the south they make Sweet Pongal, an offering of rice and dal, sweetened with jaggery and mixed with nuts, which is presented as Prasad to god. Enjoy our 251 yellow moong dal recipes given below. With five protein-rich dals, this spicy mixed dal version combines curds and traditional spices to give a tangy, spicy, delectable accompaniment for parathas and rotis. This dal can be prepared easily and quickly, but remember to soak them together for an hour to ensure uniform cooking. This is a vegetarian version of the non-vegetarian seekh kebabs. Moong dal when combined with potatoes and onions tastes simply superb. Dip these kebabs in your favourite sauce or chutney. Alternatively, serve them wrapped in rotis to make kebab rolls, a more filling snack. Stuffed to the core with iron health, this khichdi is a treat for elders and the children in the family! Moong dal panki,this easily digestible snack is sure to please your stomach, without any after-effects! remember to remove the skin of the dal for a better texture and taste. Also, you could increase the amount of besan if the batter is too thin.